Charlie, in this case, you may be able to use the minimal address they provide. The Rosicrucians are still in San Jose. Well, at least their Egyptian Museum is. That’s probably where your letter would end up. @Charlie — just change your name to 1452 Elm Avenue Extension (or whatever), and everything will work out. I grew up in a small town (population around 700), and remember hearing about a case where a letter got delivered–correctly–to a gentleman there. It was addressed to “Grandpa, Reading, VT”. As a child in 1960s Britain I was fascinated and mystified by the similar but larger advertisements which then appeared regularly in the national newspapers (though never quite fascinated or mystified enough to answer them). 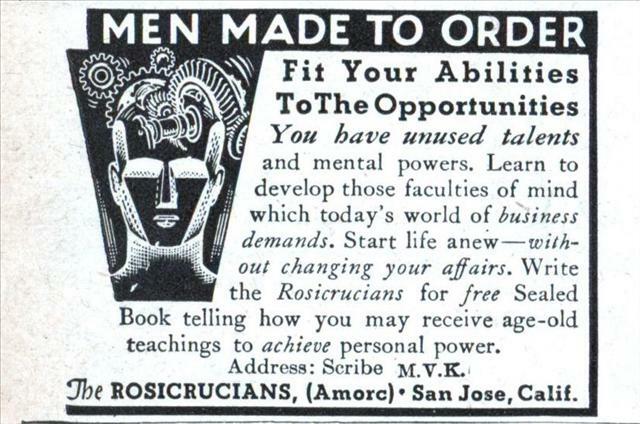 The Rosicrucians must have slashed their advertising budget since then, because I haven’t seen one in thirty or perhaps even forty years. Did they just decide to stop proselytising? I guess they still exist. Men made to order?! Why was I not informed of this earlier? BTW, what exactly is that in Mr. Metropolis’s head anyway? It looks like a spool of yarn attached to a vacuum cleaner hose. A while after I’d started this site and had posted a few ads for the Rosicrucians I noticed that they had a compound in the town I was living in (Oceanside CA). So I guess they are still fairly active. Charlene: Looks a bit like a car’s differential, which is about to have a catastrophic failure and some other random gears. And a spool of yarn.